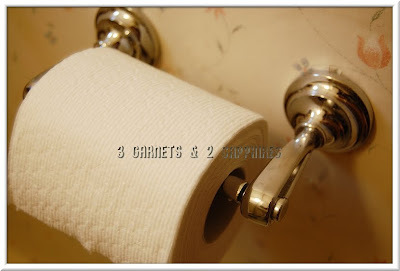 A few months ago, I had mentioned that we needed to start giving both our bathrooms a makeover and that the downstairs half bath would be the easiest to start with. I am not sure what the previous owners were thinking, but the bathroom has floral wallpaper with one chrome and glass shelf, a chrome medicine cabinet, two off-white painted shelves, a chrome and frosted glass hanging lamp, and a dark wood towel bar, toilet paper holder, and door (which has a brass door knob). Could it have been more mismatched? 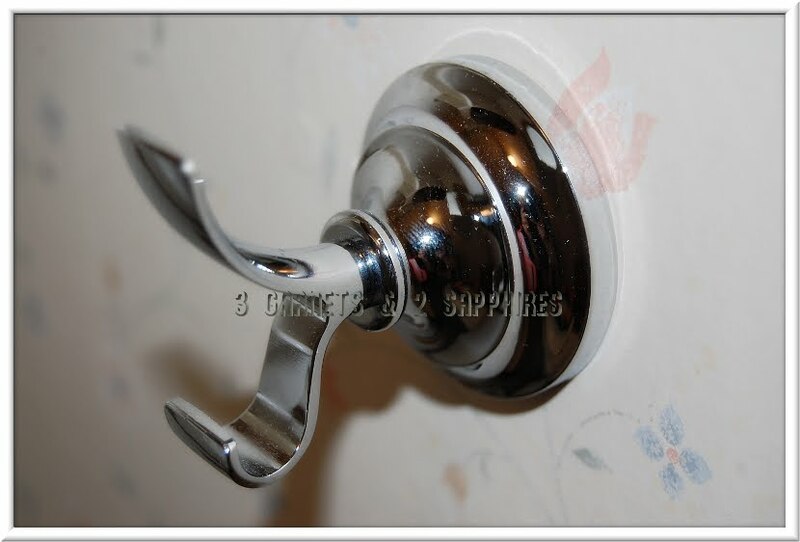 Well, we took the first step towards improving it by changing all the wooden bathroom accessories to these Moen Reed chrome bathroom accessories. We even added a few pieces we did not have before, but needed. 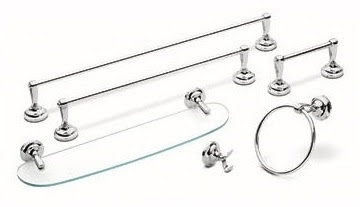 My husband was the one who installed these Moen accessories and he was extremely impressed. The installation process could not have been more easy and was essentially fool-proof. After handling these pieces and seeing them with my own eyes, I almost do not understand why some accessory sets cost a few hundred dollars. These pieces are heavy weight, attractive, and functional and only cost us approximately $90 (not including shipping) from CSN Stores for the 18" towel bar, towel ring, toilet paper holder, and 2 double robe hooks. 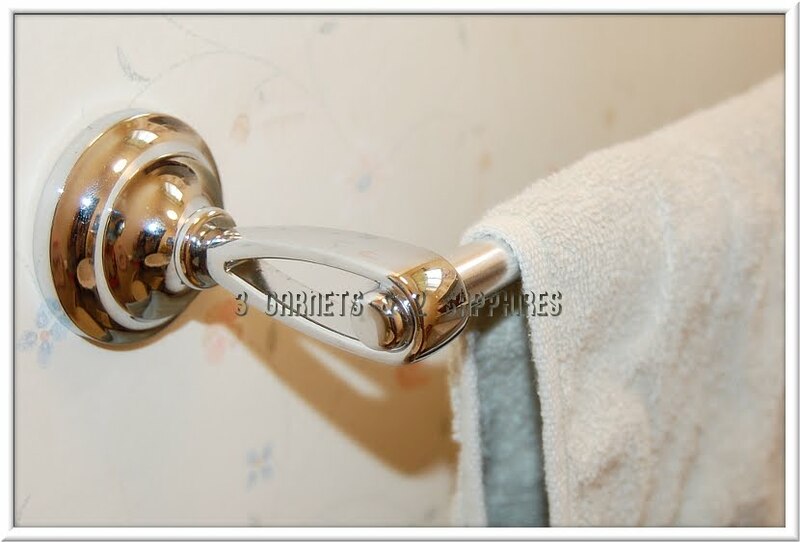 The pieces we added that we did not have before were the towel ring and the robe hooks. We added the towel ring next to the sink where our twin preschoolers would be able to reach it while standing on the step stool after washing their hands. 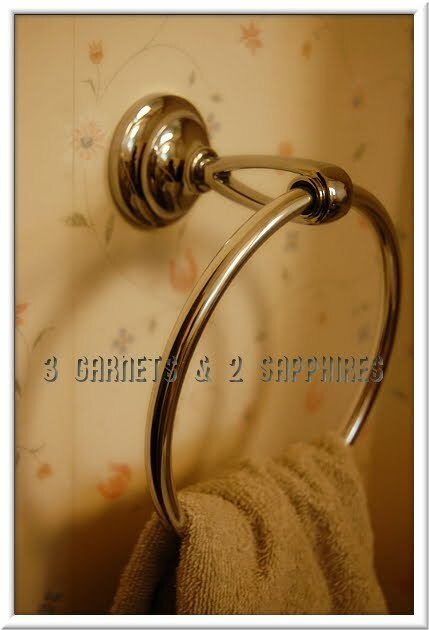 We also added two robe hooks, which happen to be perfect for hanging a Disney Princess and a Disney Pixar Cars potty seat on each right next to the toilet. We are saving tackling the wall paper for another day. Thank you to CSN Stores for providing us with a gift card to shop after participating in a previous campaign.